Thousands of devout Hindus began splashing into a west Indian river for the first official day today of bathing at one of the country's largest festivals. Hindus believe taking a dip in the waters of a holy river during the Kumbh Mela, or Pitcher Festival, will cleanse them of their sins. Today marked the first day of bathing for those attending this year's festival on the banks of the Godavari River in Maharashtra state. Millions are expected to attend this year's two-month festival, which began in mid-July and runs until the end of September. 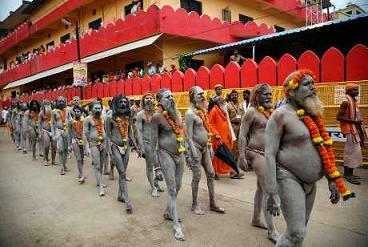 The Kumbh Mela derives its name from a mythical fight over a pitcher of holy nectar. According to Hindu mythology, gods and demons waged a furious battle over the nectar they needed to achieve immortality. Four drops spilled, landing in the four cities that alternatively host the festival: Allahabad, at the confluence of the Ganges, Yamuna and mythic Saraswati rivers; Haridwar, on the banks of the Ganges; Ujjain, in central India; and Nasik.